Port Authority Proposal Pittsburgh, Pennsylvania 15230-1041 U.S.A.
Good evening. I am Glenn A. Walsh of 633 Royce Avenue, Mount Lebanon. I have been an advocate of public transportation for more than 25 years. I was a charter member of the Allegheny County Transit Council, serving from 1984-1989. Today, I am representing no formal organization. In the 1980s, as part of the Stage I Light Rail Transit project, the Port Authority of Allegheny County constructed a seven-track rail car storage yard, at Penn Station, Downtown, for the storage of light rail vehicles in the middle of the day. In this way, time and electricity would not have to be wasted moving these light rail vehicles to South Hills Village after morning rush-hours, and then back Downtown for afternoon rush-hours. According to information PAT provided me, from a Pennsylvania Right-to-Know Law request, the cost to the taxpayers of building this seven-track rail yard was about $2 million. The problem is that, after more than 15 years, PAT has never used this rail yard. And now, with the proposed construction of the Convention Center rail line, PAT proposes to abandon the Penn Station rail line and this Mid-Day Rail Yard. If this rail yard is abandoned, it will mean the complete waste of $2 million of taxpayers’ money. I addressed the Port Authority Board regarding this issue on April 23. The PAT Board Chairman indicated that the Board would consider my comments at the May Board meeting. This did not happen, and the PAT Board has never publicly discussed this issue. Instead, I received a letter from PAT Chief Executive Officer Paul Skoutelas giving me several excuses why the Port Authority can not keep this rail yard. However, he did not address the fact that abandonment of the rail yard will mean the complete waste of $2 million of taxpayers’ money! Last month, I attempted to address the PAT Board, to respond to Mr. Skoutelas’ letter. My second request to address the PAT Board was denied. 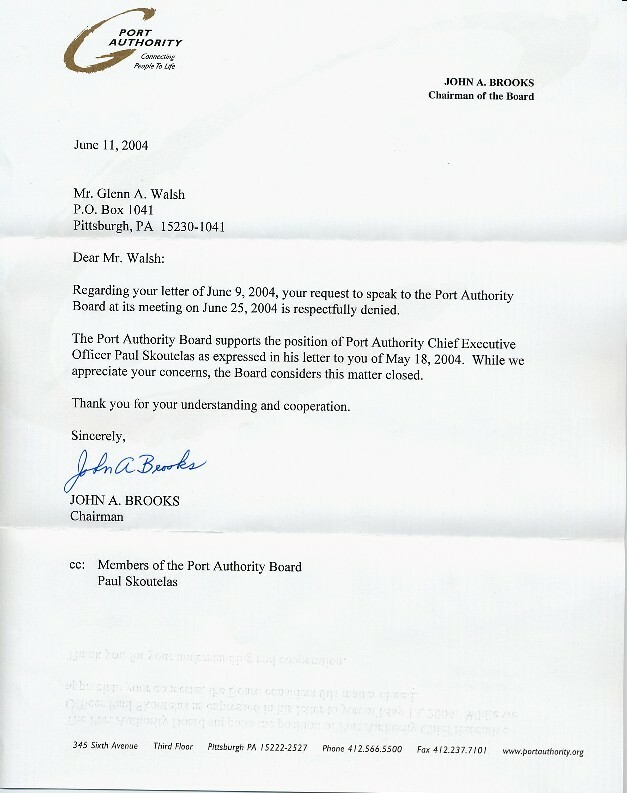 When I claimed that the PAT Board was in violation of the Sunshine Act, I received a letter from the PAT legal counsel indicating that there is a loophole in the Sunshine Act that does not require the Port Authority Board to entertain comment from the public! In my April 23 address, I proposed ways the Port Authority could use the rail yard, while still constructing the Convention Center rail line. The Port Authority claims that physical limitations preclude the future use of the rail yard. It is my view that the Port Authority has purposely designed the Convention Center rail line in such a way, so that the rail yard can not be used—and they can get rid of an embarrassment that has never been used. Of course, I cannot go into great detail in just three minutes today. Attached to this statement is a copy of my statement to the PAT Board on April 23, which includes more details. I am asking that this Council investigate this matter and prevent the complete waste of $2 million of taxpayers’ money.